The independent Analyst Company KuppingerCole Ltd. recently published a new Advisory Note regarding the Eight Fundamentals for Digital Risk Mitigation in the Age of Transformation. The author, Martin Kuppinger, Principal Analyst and founder of KuppingerCole, writes about Digital Risk Mitigation as a key success factor in the Digital Transformation of businesses. The Digital Transformation of business is unstoppable. It affects virtually all industries. The IoT (Internet of Things) is just a part of this transformation, at the technical level. However, without changing business models, organizations will not succeed. Furthermore, connecting things with apps and services is imposing new challenges. “These include product security and liability issues, but also appropriately dealing with customer ‘big’ data”, explains Kuppinger, “Identity, access and security become critical success factors for the Digital Transformation of business”. The Advisory Note is about how IT has to transform and how Information Security can become a business enabler for the Digital Transformation of business. “We strongly recommend that organizations reorganize their overall IT and in particular their IT security organization to be able to deal with the changing requirements of the Digital Transformation of businesses”, says Kuppinger. By connecting everything, the attack surface increases massively. For Kuppinger, Security by Design is becoming the fundamental principle for the future, together with an organizational structure which embeds security everywhere in the organization, instead of leaving it in a silo. Identity and Access Management becomes another cornerstone for Digital Risk Mitigation in Business Transformation. Kuppinger mentions that “It now is about managing billions of identities. Failing in IAM for the transforming world is failing in Business Transformation”. 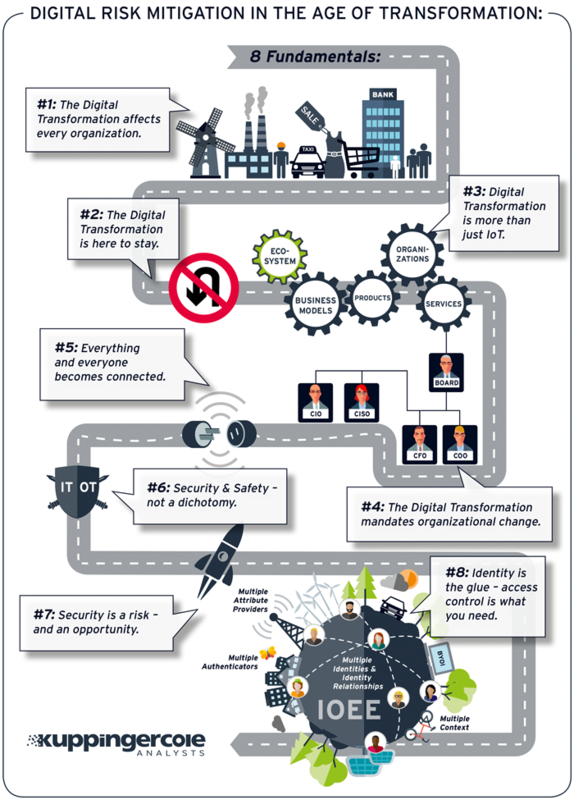 Despite all these challenges, Digital Transformation is not only a must for every organization but a huge opportunity. In particular, established businesses are well-positioned to succeed when they manage their change towards an agile, digital organization. The new KuppingerCole Advisory Note is now available for download from http://www.kuppingercole.com/reports – as well as all other KuppingerCole reports. Journalists may request this document and all other KuppingerCole analyses free of charge. Please send us specimen copies of any published articles or links to online publications referring to our reports.